This year, more than 12,000,000 pricing inquiries were made using Marksman per day. That’s over 360,000,000 inquiries per month, and over 4,380,000,000 inquiries per year. All of that data makes for a vast sample size when looking at some of the other stats and figures we'll mention below. The average interest rate for each loan quoted in Marksman this year was 3.61%, which is slightly lower than the national average over the course of the year. However, this may have had something to do with the average credit score for loans quoted for online lenders within Marksman this year, which was 723. The number 30 showed up in a couple of different ways this year. While the average lock period was 38 days, the median was 30 days, which is important when you consider that most are usually done in 30-day increments. 30 days is also the most frequent lock period, with a 2:1 ratio over any other. The most selected loan product this year was a Conforming 30-Year Fixed Loan, and the least selected product was a Non-Conforming Prepay 30-Year LIBOR 7-Year Fixed/6-Month. While market seasonality usually trends towards high loan volume locks in the Summer months, due to a dip in interest rates, October marked the highest loan volume lock month of 2014 within Marksman. However the lowest locked month, February, remains pretty consistent with the market’s seasonality trends. 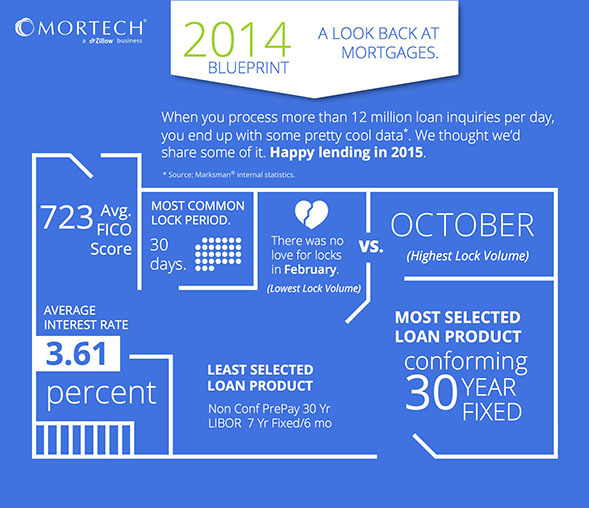 Looking ahead to 2015, Mortech is poised to continue to provide accurate, reliable pricing and mortgage lending solutions for the mortgage industry. Whether you’re an online lender, community banker, credit union, mortgage bank, retail, wholesale, or correspondent lender, Mortech has a solution to help automate your mortgage lending workflow. * All stats in this post are derived from Marksman internal data.